When will food cease being a topic of conversation in our city? Never, perhaps. It may have something to do with never-ending events (such as Michelin Guide, Asia’s 50 Best Restaurants and the recent Singapore Cocktail Festival), or someone in the group talking about the best places for champagne brunches, restos with the best views, chef collaborations. Today’s no different, and when we’re talking about the best places to hit for authentic dim sum. Whether at during breakfast (older folk), brunch (family gatherings) or supper (millennials, mostly), no one can resist her call. Singapore has no lack of great dim sum spots and almost everyone has their favourite. And what’s not to love? Each dish usually comes with just three pieces and is perfect for sharing (think of it as the #originalgangster of tapas), and it’s washed down with a pot of Chinese tea. Plus, it’s the traditional alternative to hipster cafes, though one may contest that having dim sum may just be the new hipster thing to do. The question is, in a sea of top spots, which should you pick? We’ve rounded our favourite places that serve both traditional and innovative dishes to please the pickiest diner at your table. If you’re hosting a business meeting with guests from out of town, then this restaurant is the one to choose. After all, when translated to English, the restaurant name means ‘Stairway to Heaven’, which promises diners a feast that’ll, well, have them requesting for it in the afterlife. Dim sum is on the menu here seven days a week. There are the mainstays (seven types of dumplings), double-boiled soups, and chef’s specials. Also not to be missed are Stir-fried pork spare ribs in draft beer, where meat falls off the bone and leaves a hint of malt, and Barbecued honey-glazed pork and marinated Foie Gras, an East-meets-West pairing. Dim Sum restaurants are known to be filled with a seemingly endless flow of guests, and Imperial Treasure Nan Bei at Ngee Ann City certainly fits the bill. Plus, the ringing chatter adds to the ambience of this quintessentially Chinese restaurant. In particular, the Pan-fried Carrot Cake with XO hits the right spots. The firm cubes of raddish have its edges perfectly charred, with the homemade XO chilli sauce providing that contrasting bite. It’s all ala carte here, and while many head here for dim sum, most order a side of roasted meats, along with other roasted meats and chef specials such as Pan-fried Spanish diced pork and Braised soon hock with beancurd skin and yam. How does one improve the well-loved Dim Sum Treasures experience at Jade? Apart from elevating the dining affair with shades of robin blue and paintings of native birds donning the walls during the revamp last year, Jade’s chef Leong Chee Yeng and his team have expanded its offerings. In addition to the three set menus that are already available on weekends, the team has crafted an entry-level family-friendly menu. 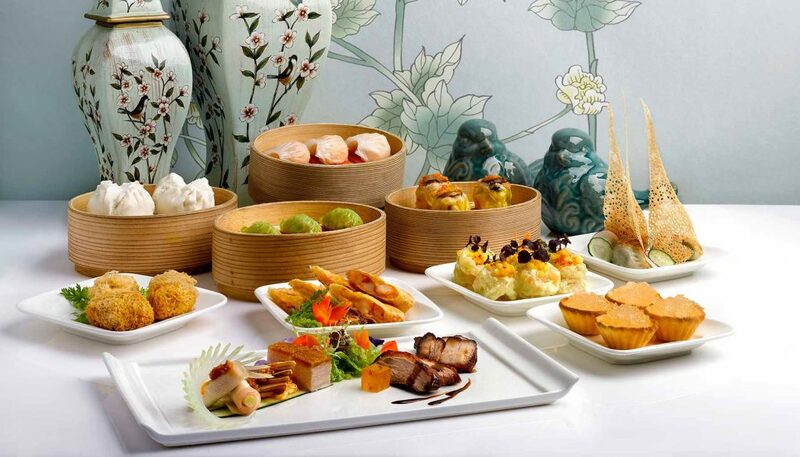 It features an assortment of five dim sum dishes including Abalone Siew Mai and Pan-fried spiced chilli crab meat bun. Take a minute or two to appreciate the silken beancurd in the Supreme Seafood Broth, chef Leong has meticulously sliced the beancurd to fan out like tendrils of a coral. The working crowd need not worry, the Dim Sum Set Lunch menu remains as part of its weekday lunch sets. Quality is certainly the name of the game here, for the restaurant has the smallest selection of dim sum offered on our list. There are just eight dishes, including steamed Teochew dumplings and fried spring rolls with yam. Now, it’s a Teochew restaurant in name, but don’t take that as a sign to skip its Cantonese offerings. One of our colleagues swears on his life that this is the dim sum restaurant to dine at. He has also promised to take us there (but has yet to act on it). Four set lunch menus are available, and each set comes with three dim sum items of your choice and a complimentary dessert. Soup, seafood and vegetable options differ according to the set you choose. This restaurant claims to herald a new era of fine dining in Singapore, and indeed it lives up to (and even exceeds) expectations. Don’t expect a typical Chinese setting, once you enter, you’ll be welcomed with a full-service bar, perfect for pre- and post-dinner drinks. Food wise, this is where you’ll go to find homey, comfort food, plated perfectly, of course. Specials include Sesame Prawn Toast, Duck & Pumpkin Puff and the jellyfish salad. For those who can’t do without a main (read: carbs) dish, a variety of noodle and rice dishes await. While dim sum is served only during lunch, the dinner menu includes four dim sum items as part of its starters. Voted one of the best Asian restaurants by numerous publications, Man Fu Yuan is where seasoned epicures go to get their dim sum fix. There are also nine premium tea pairings available with select offerings. The hearty tiger prawn vermicelli with Chinese wine and superior broth is paired with the flowery Anxi Royal Tie Guan Yin tea, while the Signature West Lake Longjing tea-smoked duck is aptly paired with a pot of West Lake Longjing tea. While the menu focuses on traditional dim sum dishes, you’ll enjoy creations such as Poached Chicken with Aged Hua Tiao Chinese and Rose Dew wine and Pan-fried sugarcane wrapped with prawns and scallops. Ala carte dim sum (from $6) is available on weekdays, while the ala carte dim sum buffet is only available in the afternoon on weekends and public holidays. Private dining rooms are also available and can accommodate between five to 40 guests. The only restaurant on this list that provides the old-school dim sum experience with the ruckus of wait staff with pushcarts hawking their wares in rapid Cantonese, Peach Garden at Thomson Plaza is a cult favourite with many loyal patrons. Prices are one of the most reasonable too, making the restaurant a hit for those on a slightly tighter budget. An interesting experience coupled with really good traditional dim sum, any dim sum fan would be satiated with the quality of the spread. If the pushcarts are too overwhelming, fret not; menus are available for perusal and ordering as well. Look forward to harmonious tea pairings ($5) which include Forbidden Dragon Pearl tea from Fuzhou and Funding Shou Mei from the Fujian province. Chef Leong Kwok Sing also makes it a point to design a new dim sum menu each month, which makes having dim sum on a regular basis all the more exciting. On the menu this month: Baked Chicken Tart with Baby Alone, Deep-fried chicken and lobster rolls and chicken and prawn Szechuan dumplings. The Cantonese restaurant even highlights its gluten-free menu items. There’s cod fish, double boiled soup, and wok-fried pork cutlet, beef and prawns — so if it’s your diet that makes you dim sum averse, you can enjoy a fuss-free experience here. At Summer Pavilion, dim sum gets due recognition from the Michelin Guide. The Cantonese restaurant retained its Michelin star in 2017 (and will probably keep its star this year too), which comes as no surprise. Delectable dim sum plated on stunning Italian-made porcelain dining ware; what’s not to love? The menu covers all its bases, with a good selection of traditional favourites and a sprinkling of fusion offerings and original creations such as Steamed coral clam with prawn, egg white, water chestnut and coriander dumpling ($6 for three pieces). The restaurant’s teas (from $7) are also supplied by Tea Bone Zen Mind, elevating the dining experience altogether. Accorded the status for Best Restaurant by various publications since its establishment, Wah Lok has proven its status as a stalwart in the local dim sum scene. Just ask those around you, you’ll be hard pressed to find a family that hasn’t been to the establishment for dim sum. It is also home to Singapore’s best baked barbeque pork bun, a hot favourite with guests. Then there are other dishes not commonly seen in other dim sum menus: Steamed crab meat and egg white dumplings, Lobster mee sua and Deep-fried century egg wrapped with minced shrimps. Dim sum is only served during lunch, and many dishes are often sold out before lunch service ends, so the early birds are more likely to catch the proverbial worm in this case. Indulge on the weekends and public holidays at The St Regis Singapore’s Cantonese restaurant. Yan Ting’s impressive menu looks to satisfy with luxurious offerings like Wok-baked Boston lobster with XO sauce and Crystal Shrimp dumpling with squid ink. Not to be missed are classics such as Pork and Century Egg Congee and Tofu Treasure Pocket filled with Seafood. Also on its menu: salmon sashimi, a variety of seafood rice and noodle dishes. And if egg tarts aren’t enough to satiate your sweet tooth, take your pick from seven Chinese desserts, including local favourite Chilled Mango Sago Cream with Pomelo. Set menus ($65++ or $105++ per person) and regular ala carte buffet menu are also available.